The Wedding AlBUM: freeging excited! I have spent 2 weeks writing a Kickstarter video script, shooting the Kickstarter video, editing the video, tweaking the video, writing up my proposal for The Wedding AlBUM, and coming up with awesome sponsor prizes (wedding gifts)! I was surprised at how long it takes to get all that together. But it was fun! And. I. Am. So. Freegin. EXCITED! Kickstarter is currently reviewing my The Wedding AlBUM submission. Hoping they will approve it by early next week. As soon as it is approved, I am launching the Kickstarter. Look for it early next week. Then, Austin's Voltaic Video Productions is recording The Wedding AlBUM CD/DVD March 28/ 29 at Austin's The Institution Theater! 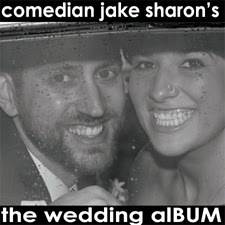 Releasing The Wedding AlBUM CD/DVD on Callie's and my 2-year wedding anniversary, September 29th, 2014! Except instead of you giving us gifts, WE are giving you gifts! Yay!